EVERY NOW AND THEN you see a project that takes on a life of it’s own. The story of Eldee is part of NZ’s racing folklore. The twist is that a dedicated bunch of enthusiasts, including our classic man, Chris Swallow, have serious plans afoot—but they might need a wee bit of help… NOT SO EAGLE eyed observers visiting the Honda museum in Motegi, Japan will notice soon after paying their yen there is a racing motorcycle devoid of the familiar winged Honda vector. The emblem is distinctly Italian and proudly informs that you are ogling over a ‘FB MÒNDIAL’: made 1957, Milan by the Counts Bosselli (‘FB’ being Fratelli Boselli or Bosseli Brothers) and their firm Mondial. 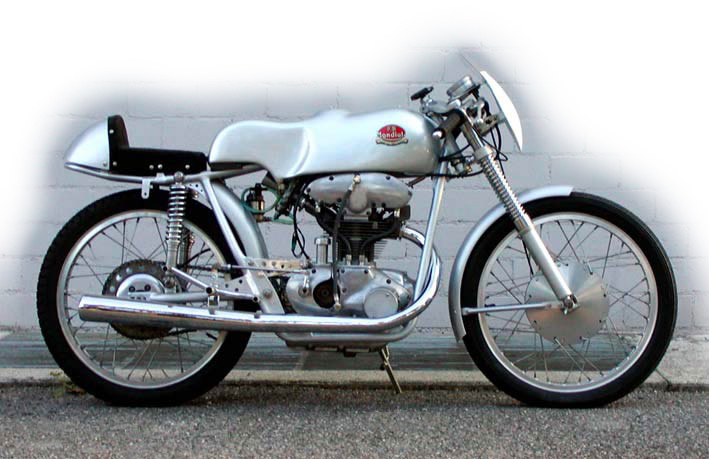 It is a gear driven double overhead cam (DOHC) 125cc Single Cylinder Grand Prix motorcycle, brought by one Soichiro Honda, direct from Count Boselli shortly after it won the 1957 World Title. 1957 was the year the Italians (with the exception of MV Agusta) all pulled out of Grand Prix racing due to the cost of it all; prior to this they had been leading exponents of high revs, high performance and high reliability; characteristics clearly endearing to Mr. Honda and his fledgling motor company. Les Diener was a racer and a brilliant engineer. 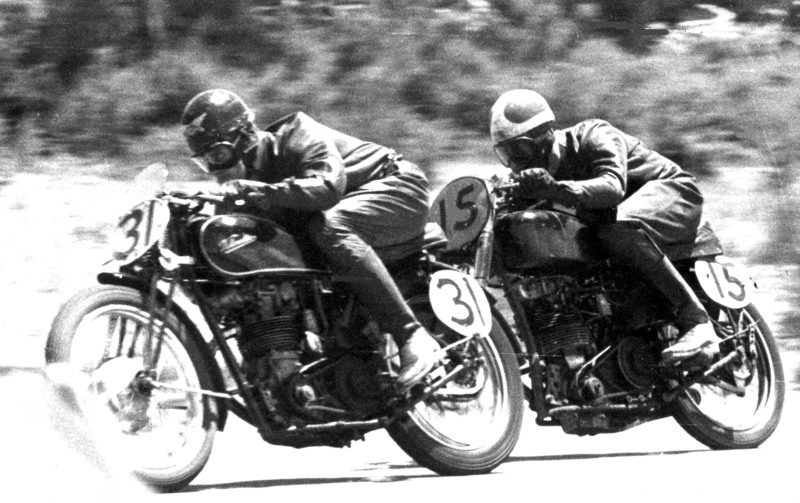 In 1958 Soichiro Honda visited the Isle of Man TT for the first time, then returned in 1959 with five riders and his first bikes: 125cc gear driven DOHC twins. They won the team prize, with a best result of 6th, came back in 1960 for a best result of 4th, then scored a double victory in 1961 before proceeding to re-write the history books as to which manufacturer should win the most motorcycle races (and seeing off the antiquated British bike industry in the process….). But back in 1953, way before 1957 and Mr. Honda stripping his DOHC Mondial into it’s constituent components, a talented thirty two year old Velocette enthused South Australian had long been aware that a series of gears driving two camshafts was the way to go: and he had just finished his first example of such. His name was Les Diener, and he gave his initials LD to his creation: the Eldee. Portrait of Les Diener racing in South Australia, probably in the late 1940s. Les Diener became hooked on bikes at the age of 13 when he and lifelong friend Keith Hamilton would pool their pocket money to ride (and fall off) an old single geared, belt drive Levis two-stroke. A year later Les then came by an old V-twin, side valve JAP engine which was the basis for his first bitsa and offered ample opportunity for the honing and development of his clear engineering talent. The next step forward was a 350cc OHV New Imperial Jap, then a trade in for a 1936 Douglas, followed by the acquisition of a quite special overhead camshaft (OHC) 500cc CS1 Walter Moore Norton at the age of 17. 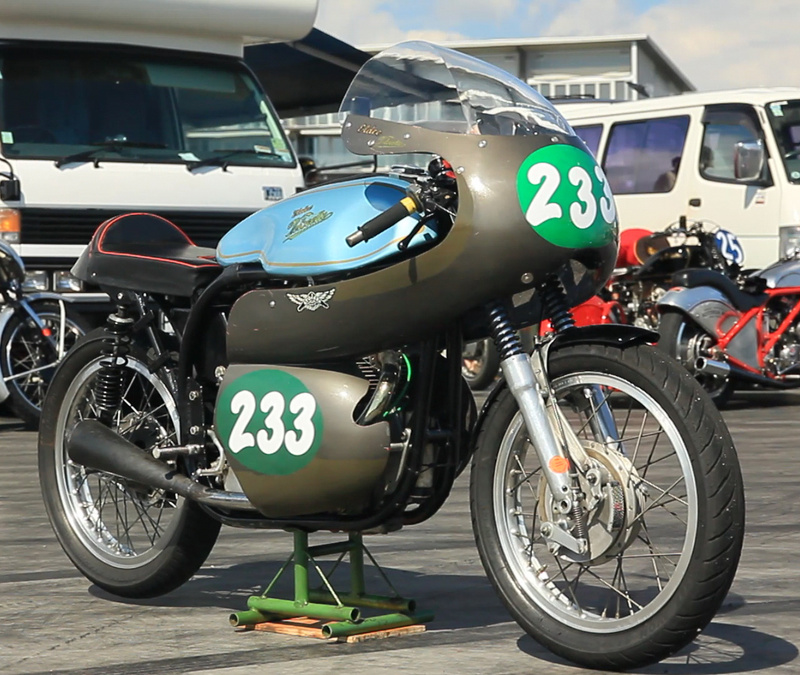 The Walter Moore had to make way when a 350cc OHC KCR Velocette brought out from England by Rex Tilbrook came up for grabs; a lifelong passion for the marque was born. Les began racing with the Atujara MCC in 1938, predominantly in scrambles and beach racing and showed a certain speed and deftness from the off. The KCR Velocette was sold in 1939 and replaced by a 1934 model 250cc MOV Velocette which became his main interest for the next fifteen or so years as a racer and his lifetime interest as a tuner. Despite many wins and South Australian championships, Les realised he could extract no more power from the MOV’s pushrod configuration and so gave some serious thought at the end of the 1952 racing season to convert his beloved MOV into a double overhead camshaft racer: thus Eldee 1 was born in 1953. Inspired no doubt by the Italians, fellow Australian Sid Willis grafted a DOHC factory Velocette head onto his 250cc Velocette racer and proved very difficult to beat in the late ‘40s and early ‘50s, taking his bike to a fine fifth in the 1953 250cc Lightweight IOM TT. Following in these footsteps, Les and fellow competitor at the time Ted Carey both got busy on their own conversions, in Les’ words, “working and racing together on separate projects,” (incidentally Ted provided the piston and head for Eldee 1 to Les). 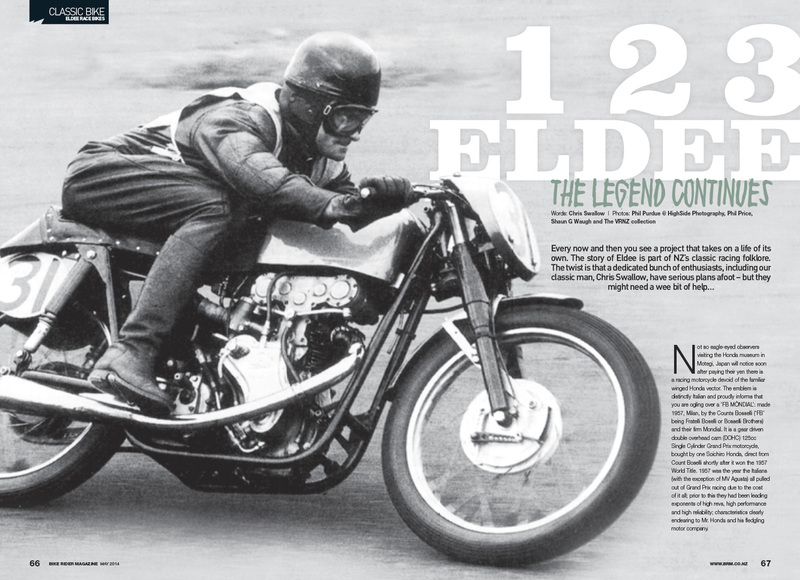 Eldee 1 matured into ‘the bike to beat’ and was a testament to Les’ ingenuity and engineering capacity, clocking up a multitude of wins and placings and famously seeing off the works 250cc Moto Guzzi of Fergus Anderson when he came out for a visit to the Woodside race circuit. Following in Les Diener’s home-brewed footsteps, Nick Thomson machines a new special casing for the Eldee’s Velo’s chain of nine spur gears that drive the camshafts. 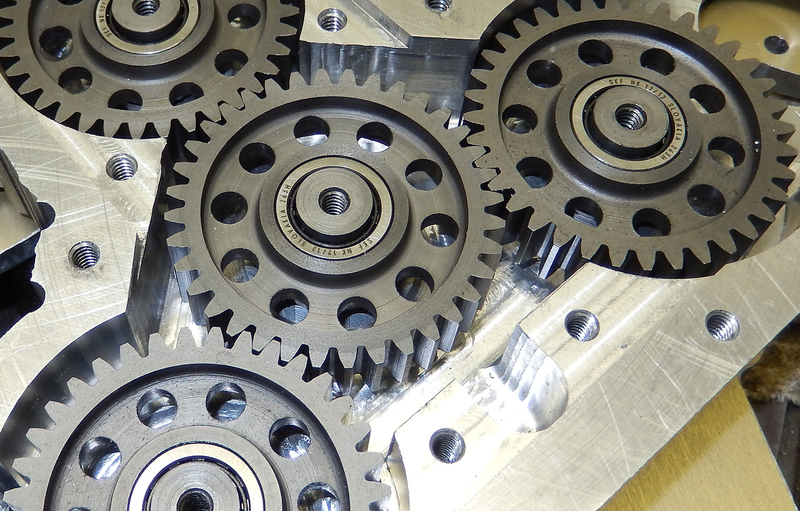 Closeup of the new set of spur gears mounted in their casing. Original patterns for the cam box and timing cover castings were in the hands of Adelaide enthusiast Peter Westerman who proffered them for use for the replica, or Eldee 2, at the start of 1987. 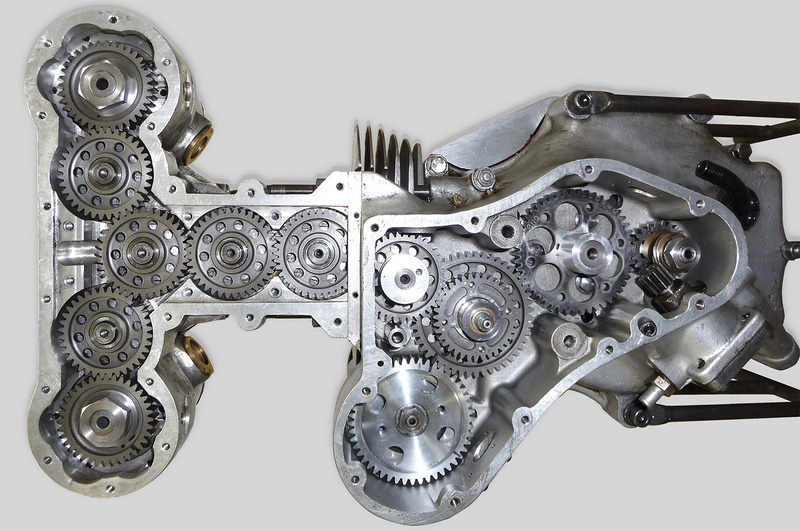 The timing side crankcase is standard MOV with obvious modifications to accept the train of gears, which were originally modified BSA items but now completely re-made and hot from the Thomson workshop, all running on needle rollers. The drive side crankcase is a cast item recreated by Adelaide foundry Castech in CP601 aluminium alloy. Perhaps not as elegant as certain Italian items, though the webbed ribs on the outside do offer strength to accompany the heat treatment. Security of camshaft to gear is via a pin vernier, an item we have had fail, resulting in a bent exhaust valve (soon to be turned into my wedding ring…) and sheared the key locating the gear on to the camshaft. Nick has re-engineered the camshaft to accommodate an oversize key in addition to an increased diameter pin into the final gear and initial runs show good. Valves are Superalloy now, replacing the Eso Speedway components Les fitted, the exhaust being 1” 7/16 and the inlet 1” ½. Les’ notebook detailing the early tests of Eldee 2 show a plague of oil from the coil valve springs (on the advice of Bill Lomas, valve spring seat pressure was set at 90lbs resulting in 160lbs pressure at full lift, showing horsepower increase and no loss of valve control) a problem which we suffered from too. Nick has been successful in curing this problem by making eccentrically turned caps to accommodate and enclose the valve gear, springs and exposed pushers, in addition to fitting an oil feed to drain pressure from the now capped area. The conrod is a hefty titanium number that wouldn’t look out of place in a 350; it is ‘I’ beamed and trimmed substantially and connects on the southern end to a big-end needle roller pressed between high tensile steel flywheels balanced to a factor of 80%. We feel gains could be made upping the balance factor, finding a significant ‘roughening’ and increase of vibration at around 8,200rpm. The engine will rev to 9,000, but is discernibly smoother below 8,200 and seems to labour more obviously after this point. The little-end connects to a piston recovered from some Les ‘made back in 1956’ and when he set up the engine for initial testing it was on petrol with a compression ratio of 8:1. It is now on methanol with a compression ratio in the region of 10:1. With a large dome and fairly long skirt, the piston shows extensive working inside to remove excess material, clearly the work of a dedicated tuner. The piston resonates in the same ‘square’ bore dimensions as Eldee 1, 68 x 68.25mm, the barrel being the favoured Alfin type, modified in this instance from a later 350cc MAC Velocette component. Hubs and brakes were cast to 1938 Mk VIII KTT Velocette specification after Les had a chance encounter with a retired pattern maker who offered to assist with the project ‘for a challenge’; the resulting aluminium items are laced to 18-inch Akront alloy rims shod in sticky Avon rubber. The twin leading shoe front brake is lined with high grade centrifugally cast iron and works very well indeed, the pads being green in colour and probably not worth inhaling near. The entire rear hub is made from the same material and it too works very effectively: soft and progressive and none too harsh. Such castings would perhaps have been better in magnesium as they are bulky affairs with great wall thickness and the choice of aluminium weighs heavy for a 250cc: the overall weight of the bike is around 270lbs (122kg). The chassis is sprung sufficiently on the rear by heavy Koni items and up front are Norton forks, with beautifully crafted lightweight alloy yolks and taper roller bearing head races. The original fork springs have been discarded in favour of heavier weights, as Les must have been somewhat lighter than me and we have also added adjustable dampers supplied by Lansdowne Engineering in the UK, giving us effective control of both compression and rebound damping. The front-end has always felt vague to me, with a tendency to patter exiting corners, despite many efforts to cure this. We made a fork brace which helped, but I think the weight of the lumpy front hub plus a not quite sorted spring rate is accentuating a bounce, but we’ll get there. The frame is a modified Norton International model, sporting Les’ own rear section, nickel-bronze welded to the front cradle and resulting in a lowered seating position, a factor that may also contribute to the unsettled front end with my heftier bulk aboard. At the back it sports a standard cased Velocette gearbox, hiding six speeds to keep the little gem on the bugle. A low level exhaust pipe stays clear of the track and protests by cracking when secured at the original three mounting points, so we leave it mounted at the head and before the megaphone taper and it seems happy enough. Eldee 2 in pit lane at Hampton Downs, February 2013. Sparks are provided by a Les Diener wound magneto that now accepts an electronic triggering device from a Mitsubishi car and such sparks set fire to a mix brought in through a faithful Amal 1” 5/32 carburettor, with a number 5 slide and jets to suit circuits. Needle is a Dave Kenah component with additional adjustment slots for height positioning. The fairing is a double bubble Morini item shrouding an aesthetically pleasing package, contributed to by the light blue 12litre tank made by UK company Lyta, held down along the middle by Les’ own tank strap and decals proclaiming ‘Eldee Velocette’ in a familiar insignia. All in all, it took a retired Les Diener a little under two years of beavering away in his small workshop to create Eldee 2. Taking to the track again aboard this faithful replica must have been some thrill for Les who, at 69 years young, showed he could still do it, racing to forty exceptionally well earned trophies inscribed with either 1st, 2nd or 3rd. At the age of 73 Les suffered a heart attack whileout riding on his Italian Gilera road bike, never getting the chance to gather up some more silverware but leaving one hell of a legacy. As I mentioned, it has been a proud privilege to add to the history of this bike and the lineage of the Eldee marque. 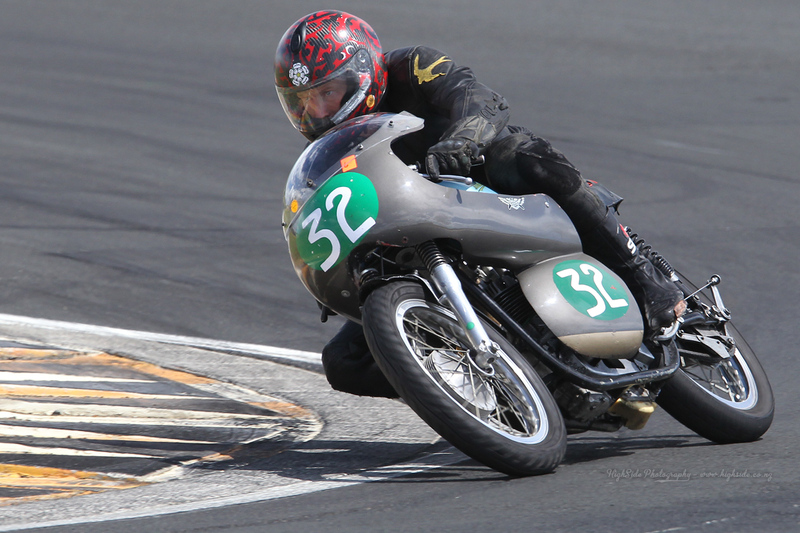 We started racing Eldee 2 in 2012 and have won two NZCMRR 250cc modified titles since then, only missing out on the third title as in the last round I felt it wasn’t a bad idea ‘to have a go at the 350s’, so rode out of class to some second positions behind Nev Bull’s rapid short-stroke Manx Norton. Eldee 2 has started the 2014 racing season in winning form already and it is to the future and Eldee 3 that this story ends. Eldee 2 was in no doubt a more modern yet faithful replica of Eldee 1. With improved materials and greater knowledge of methods and concepts, Les improved on what was already very good. Eldee 2 was made over twenty years ago, and in that time ‘modern classic racing’ schools of thought have advanced in leaps. The prospect of developing the tried, trusted, proven and tuneable gear driven, DOHC engine format was something that our small team began to relish with more vigour as the results from the race track, in both performance and reliability, mounted up. Thought was given to really giving matters a proper test and there’s few places one can go to do that. One is the Isle of Man TT circuit. And to go over there for the 2014 Classic TT we decided a new motor was in order, with the tried and trusted Eldee 2 due for a refresh to serve as a backup. And we also decided a man of experience would be welcome in the saddle. So we gave my Dad a ring, who is still to this day the fastest man around the TT circuit on a 250cc single cylinder (98mph average), 350cc single cylinder (102.23 mph average) and 500cc single cylinder (108.03mph average) machine. Nic Thomson has been a busy boy. Whenever I visit, the piles of swarf are ever higher. Since Eldee 3 was conceptualised, he has whittled a shoe box sized lump of aluminium into a beautiful cam box. He has made the nine gears to drive the camshafts adorned with his own cams. The conrod has been crafted and is away for heat treatment. The piston is due to be forged shortly. New ‘old’ stock crankcases have been modified to accommodate the gear train. Murray Aitken (instrumental in the development of John Britten’s iconic motorcycle) has designed and is about to cast a new head. The new motor will be housed in the existing Eldee 2 chassis with some subtle alterations to suspension and wheels in the interests of handling, safety and weight saving. A carbon fibre fairing has been designed, wind tested, sculpted to channel air across heat build up areas and is due for production soon. A new larger capacity oil tank has been fitted and an ergonomically designed 19 litre tank is on the cards to allow the rider to get wrapped tight to the bike without having to make a fuel stop in the four lap race. We’re under no illusions that the Isle of Man can find you out! 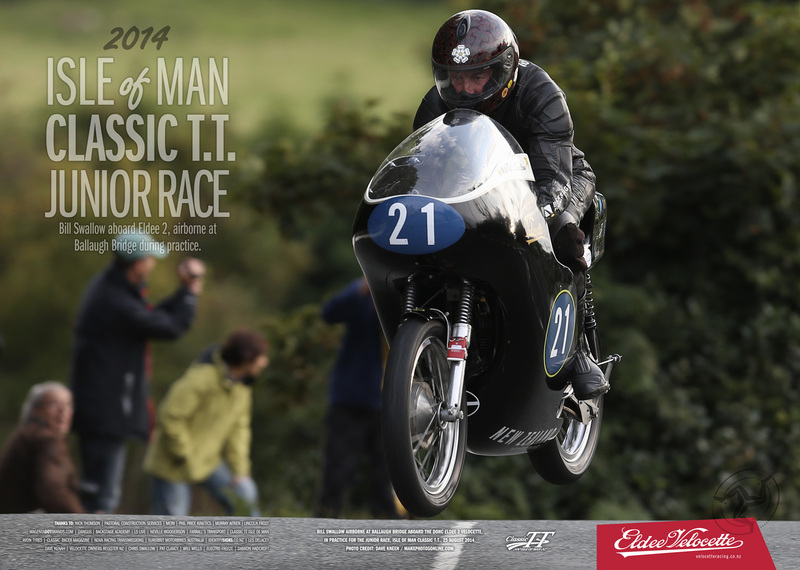 But every effort is being made to leave no stone unturned in our quest to see the Eldee finish the Classic TT 2014, and to that end I’ll finish with a plug for support. We are a small team of dedicated enthusiasts, not doing anything for profit. Support has come from some areas already but this project could do with more to see it achieve it’s potential. We are seeking sponsors to help in these aims. The Swiss watch of the classic world. The engine retains the standard MOV bore and stroke of 68mm x 68.5mm and the double overhead cams (camshafts made from 60 ton steel, cams from oil hardened 12% chrome steel) are driven by a series of nine timing gears mixed from Velocette and BSA sources, with the inner timing case being welded to the crankcase. Oil reached the cam faces via a .030 inch jet and drained through the distinctive ‘Y’ pipe to the sump. Valve timing variation of three degrees is catered for by vernier adjustments on the final gear wheels (more on this later…. ), a two piece crankpin dissects a Symco rod and is hugged by Les’ turned mild steel flywheels. Exhaust valve was sodium filled and the inlet chrome-moly, both running in bronze guides and brought back to seat by 140pound springs. Valve to piston clearance was minimal at just six thou’, and tappets were set at eight thou’ inlet and fifteen thou’ exhaust with Les practicing and racing without checking matters as he was confident, “that with the double-knocker engine, they were guaranteed to stay put.” The piston (made by Ted Carey) is a slipper type running a “moderate hemisphere up top and a compression ratio of about 10 or 11:1,” (on methanol). 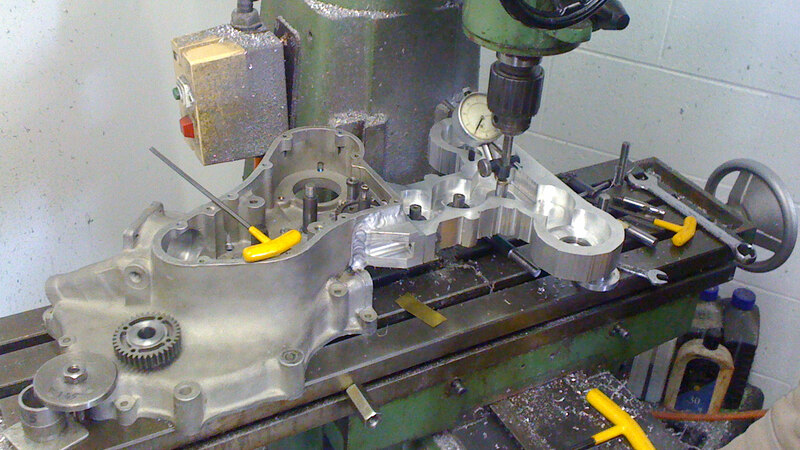 Machining the special casing to house the Eldee 2 camshaft drive train. Les had problems initially with the alloy cylinder he made to couple with a cast iron liner. He found he was losing compression under load as the motor got hot. He worked out that the iron liner had no flange to sit on top of the alloy cylinder and due to the cylinder head joint being partly on aluminium and partly on iron, as the variable expansions occurred, compression pressure was being lost down between the two metals until the engine cooled again. He related this back to Veloce Ltd in the UK who promptly sent him a patented Alfin barrel with a bonded-in liner; end of problem. The chassis was, in Les’ words, ‘the best of two worlds’ being a home-made frame with a front end dimensionally similar to McCandless’ ‘Featherbed’ and the rear end similar to that of the 7R AJS. With a single top tube favoured instead of the Featherbed’s twin rails Les hand-beat a 4 gallon tank into what I consider a lovely, svelte and tapered shape allowing the jockey to get himself ‘tucked right away’. Forks were from a BSA C10 but shortened by four inches to keep the whole head assembly low and then fitted with Les’ own design of damping rods. 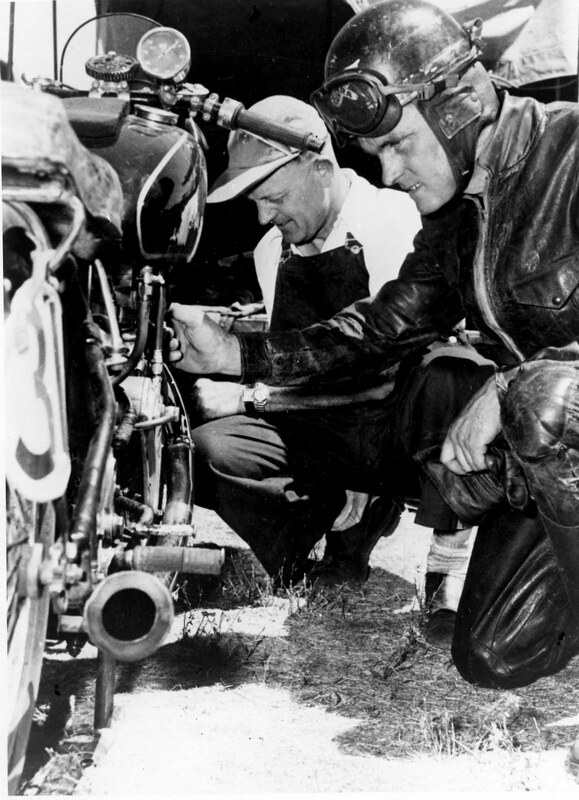 The gearbox was four-speed with original Velocette ratios as standard, though Les had alternates that could be changed depending on the circuit. 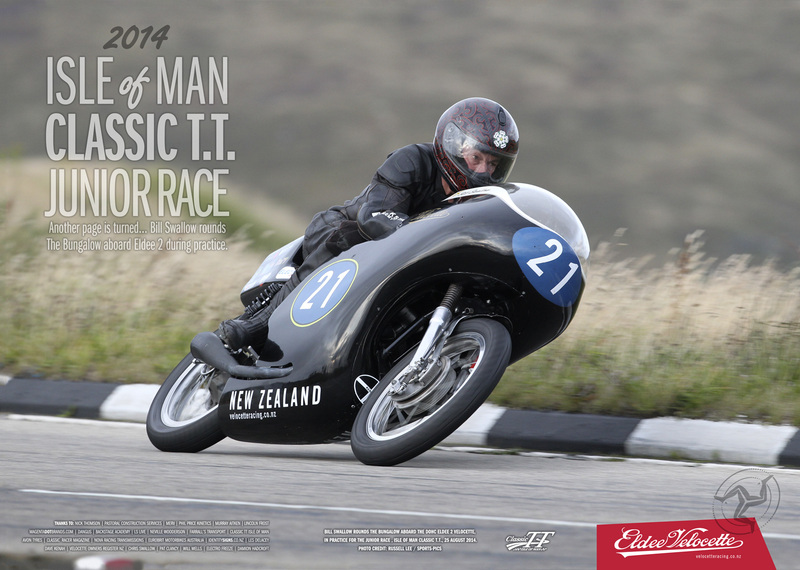 Photos: Phil Purdue @ HighSide Photography, Phil Price, Dave Kneen @manxphotosonline.com, Russell Lee @Sport-pics, Shaun Waugh @MagentaDot Brands and The VRNZ Collection.